A major goal of China’s aggressive military modernization efforts is the development of a stealth military aircraft that rivals the US F-22. This ambitious development program recently unveiled its first test aircraft, the J-20, and has brought enormous public attention to China’s growing military capabilities. Prospect Blog recently had the chance to sit down with IGCC senior fellow and IRPS professor Dr. Tai Ming Cheung and discuss the future of the J-20 program and Chinese military ambitions. Dr. Cheung is an expert on Asian security, and conducts Department of Defense-funded research on China’s military capabilities and technological potential. J-20 flight testing. Image at defensetech.org. Prospect: Where do you see the J-20 program going this decade? Dr. Cheung: The J-20 is a clear demonstration of China’s intention to catch up with the few countries that have been able to develop stealth aircraft. The US is the only country so far to field an operational aircraft and the Russians are attempting to develop a stealth aircraft [the T-50], but the Chinese are a very long way behind. The important thing is that this Chinese demonstration means much more in terms of its intent rather than its capabilities at the moment, and the program has a very long way to go. There are going to be a lot of ups and downs with this program, and I don’t think the Chinese will be able to begin to get an aircraft of this type in operational service for at least the next five or 10 years. Even then, what they can produce will be something that is still 10 to 20 years behind what America can produce. But over the longer term the Chinese have made it clear that stealth fighter aircraft, which in many ways are the height of technological military power, are where they want to go. This is an effort to lay claim to that, but it’s clear that they have a very steep path before they get there. Prospect: Do you think that the Chinese leadership has the motivation to actually go through with this program? They have several alternatives available — the Su-33-derived J-15 naval fighter for one — and funding a domestically developed stealth fighter is so much more expensive than adapting a foreign model. Do you actual see any desire within the Chinese leadership to actually make this an operational aircraft? Dr. Cheung: When you look at it in terms of Chinese priorities, what their threat issues are, I think that they see this as a very important program and I think that they have invested the political capital to make this work. To be a global military power that is respected and to be able to defend your own security air power is crucial. We’ve seen this in the Gulf and Kosovo and the conflicts that the US has been involved with in southwest Asia where air power has been critical. China sees its main long-term security concerns in peer-to-peer competition with the US and its allies in the region, and air power is clearly a fundamentally critical component of military competition. If the Chinese don’t have the capabilities the US has, especially in stealth, they think that the US will not take them seriously. Given all of these strategic issues, and also because there is so much innovation that would help the military to drive other parts of their modernization programs that are incorporated in stealth aircraft — in terms of composite materials, engineering, and the engines — developing a stealth fighter would allow them to be able to diffuse this knowledge and modernize their forces. So I see this as one of their most important programs to ensure that they are respected as a global military power. Prospect: Do you see China’s efforts to develop the J-20 as also motivated by India’s stealth aircraft ambitions as well as a desire to militarily compete with the US in the western Pacific? Dr. Cheung: I think that India is a fairly low priority for the Chinese in terms of its military modernization issues. China does see the Indian’s cooperation with the Russians in the T-50 fighter program, but there India is very much a junior partner mostly providing funding and economic support rather than the engineering and technological capabilities. I don’t see that India plays much of a role in terms of a driver for what the Chinese are doing with stealth aircraft. It’s primarily focused on the US, and the US’s long-term willingness to sell some of its stealth aircraft to its allies, particularly with the F-35. [US Defense Secretary] Robert Gates was in China when the J-20 had its demonstration flight, and he went to Japan immediately afterward and told the Japanese that they should buy is our stealth aircraft. So, what China sees the long-term security dynamics in the region, especially in the air power domain, that the US has the air power but are willing to export it. Japan and Australia are F-35 customers and the Singaporeans have also expressed interest, so the balance is shifting so that if you don’t have a stealth aircraft you’re not going to be top league. So that’s where the main motivation for the Chinese are focused — mostly in East Asia, not South Asia. Prospect: One of the things most interesting about the J-20 is just how different it is from the American approach to stealth aircraft. It appears to be much bigger, and much more optimized towards a higher warload and range rather than extremely effective stealth. What do you think these features say about China’s strategic outlook? Dr. Cheung: Well, I think that it’s very early to tell. My view is that this is a technological demonstrator, and it has a long way to go before it’s finalized in terms of the design specifications that would lead to production and deployment. 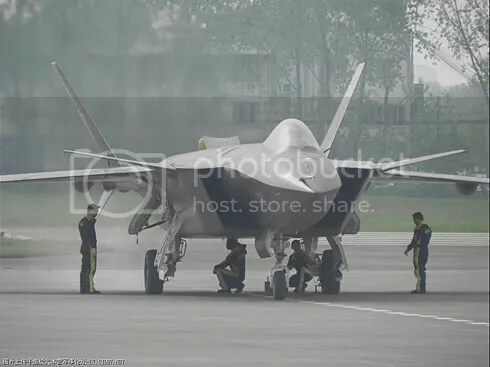 It is very early to say what the Chinese have in mind from where the J-20 is and where it many eventually go, but it is clear that this is a heavy aircraft. If we are to assume that the design that we’ve seen will stay in the same general configuration, it would be primarily a part of China’s forward defense doctrine, intended to be able to defend Chinese territory beyond China’s territorial boundaries and out into maritime areas, so it is intended for power projection capability. But there are a lot of rumors going out that this may not be the only stealth aircraft the Chinese are developing. If you look at the People’s Liberation Army Air Force today there is a mixed configuration in their fighter power arsenal — a mix of heavy type aircraft like the Su-27 and the J-11B — and they also have a large number of much lighter single engine aircraft. So even if they have the J-20 it would indicate that they would additionally pursue a lighter stealth aircraft as part of that overall mix. Prospect: What changes do you expect to see between the prototype J-20 that we have seen so far and any potential operational variants, five to 10 years down the road? Dr. Cheung: This is a very difficult issue. The F-22, for example, first came out in the early 1990s and took ten years to move to eventual production. The aircraft itself went through major changes because a decade is a generation, and a generation in technology development is a very long time. So while the overall airframe might seem very similar, in terms of what goes inside it is very different. Additionally, the threat environment can change is well. The F-22 was designed for the Cold War to operate against the Soviet Union, and today there’s a question about what you now employ it for. The Chinese have to deal with a similar question with the J-20 and in another decade or so they might face a different threat environment, whether it’s dealing with the Americans or another threat. The F-22 was an air superiority fighter but today its advocates are trying to emphasize its importance in network-centric warfare, and the F-22’s use as a coordination point for communicating with other aircraft so it’s not just used for fighter superiority but it has other roles and missions. That is what the Chinese might try to look at with the J-20. So it’s not just designed for one role, but it has a lot of other missions it can perform and can change what types of technologies go into it. Prospect: Would you judge the J-20 as being competitive with American rivals like the F/A-18E/F series and the F-35C? Dr. Cheung: I think the J-20 is a very different fighter because if it possesses all the attributes of a genuine stealth fighter — both in terms of its reduced radar signature, ability to supercruise and ability to serve as a major sensor coordinator within the Air Force —that makes it a far more potent aircraft than these fourth-generation fighters like the F/A-18. In that way I don’t think that they would be employed to directly deal with a J-20 type aircraft. The F-35 is also a very different aircraft, since it’s not an air-superiority fighter but is primarily aimed to be a multi-mission aircraft. It doesn’t fly very fast, and it’s not very maneuverable but it is more cost effective and is designed to perform a whole range of missions relatively well but without one role that it does very well. Because it is much cheaper its capabilities are somewhat more limited compared with the F-22, and putting the F-35 against the J-20 would be somewhat different. I think the J-20 is more pitted against the F-22, two much more similar classes of aircraft. Prospect: It seems like the J-20 displays a deliberate choice between stealth and affordability. The J-20 appears, at least at this point, to be less stealthy than the F-22 and possibly the F-35. What does this choice say about China’s industrial capabilities and future strategic expectations, and what does this say about the operating environment the J-20 is built for? Dr. Cheung: I think that when making major extrapolations about the J-20’s affordability or stealth we are still in the rounds of speculation which don’t really make much sense until we know more. There’s much more we need to know before we can make these kind of strategic, industrial and political economy assessments. Prospect: What affect do you see the J-20 having on American military planning? Does this change anything? Dr. Cheung: It certainly makes the US, especially the Air Force and the Navy that primarily deal with China, a lot more concerned. Whether the J-20 itself or some other variation actually enters service, that the Chinese allowed the flight of the aircraft to be unveiled publicly was a major strategic signal to the US. Now the US in engaged in a major strategic rethink about how to deal with Chinese military power and is now developing a new doctrine, the AirSea Battle doctrine, in which a critical component is how to integrate US air and naval power in dealing with major power threats. So I think the J-20, along with other Chinese military development projects — especially their anti-ship ballistic missiles and other area denial and anti-access capabilities — are the primary concern for US military and strategic planners going forwards, much more than Iraq and Afghanistan. Prospect: To what degree do you see the Chinese military achieving parity with the US in the western Pacific in the next 30 years? Dr. Cheung: Well 30 years is a very long time, and I think that the Chinese military power today has a very long way to go compared to where the US is. For the next 10-20 years the main Chinese focus is on asymmetric warfare. They don’t want any kind of head-to-head confrontations with the US, so they’re primarily focused on finding what vulnerabilities the US has, whether in US naval power projection in terms of forward deployed naval forces or military satellites and communications systems. But much further down the line, after 2030, if current strategic, economic and military trends continue the Chinese may have a far stronger economic base that’s more innovative and technologically developed they may begin to challenge the US. Not necessarily in the whole of the western Pacific, but in what the Chinese call their first and second island chains, the areas closer to continental Asia. Here they may be able to make a major challenge in terms of pushing back US preeminence. Going beyond that into to the Western Pacific closer to the US, I think the US will continue to have a major dominance in that area and I don’t see the Chinese being able to challenge further out beyond that for a long time. Note: Previous Prospect coverage of the J-20 can be found here and here.